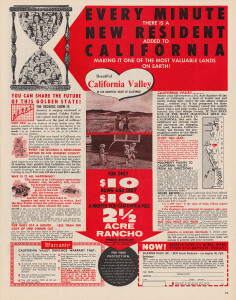 “Beautiful California Valley in the bountiful heart of California, for only $10 down and $10 a month you can own a full 2 1/2 acre Rancho midway between San Francisco and Los Angeles.” This is just part of the pitch made in a 1961 full-page LIFE magazine ad when a developer carved up a dusty alkaline desert into a grid of over 7200 parcels with nothing more than scraping out “roads” and adding some signs. Located 50 miles east of the California pacific coast, in the Carrizo Plain, California Valley is comprised of over 24,000 acres that were unsuitable for farming or ranching. This series of photographs picks up some 50 years later on that California dream. From the start there have been many problems with California Valley: lack of paved roads, isolated location, lack of power, weather and dust. But the most serious problem has always been the scarcity of drinkable water. Although there is ground water in most areas, it is most often too alkaline to drink and with out good water the county will not issue a permit for a structure. This is where the cycle starts. Lured by the prospect of cheap land (2 1/2 acres recently sold on eBay for $1280) the hopeful buy a parcel and start moving all their worldly possessions to it. Unable to find water or even afford a well, the county eventually evicts them and they walk away. Inevitably the parcel reverts back to the county for back taxes and is sold at auction to a real estate speculator and the cycle begins again. In the barren landscape of California Valley one thing is a constant. There is always a new crop of tumbleweeds and con men ready to take advantage of the desperate and gullible.